We welcome children of all ages and socialised pets by prior arrangement. We will also welcome you for a 1 night stay for those who are en-route to their destination. We are able to provide separate beds in the same open plan cottage should friends be travelling with friends as this is a cost effective option. Safe off street parking for trailer’s and caravans, with plug-in facilities for overnight. 2 Cottages are wheel chair friendly with easy access from parking into the cottages. Std Bookings – a 50% deposit is required within 24 – 48 hours, as we unfortunately cannot guarantee your reservation without a secured deposit, especially during the peak times. 1 Week prior to arrival date - full payment is required at the time of making a reservation. 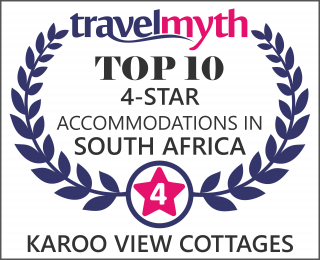 Karoo View Specials - full payment is required within 24 – 48 hours in order to secure your reservation. Please no Cash or Cheque deposits for Specials. We would prefer payment via EFT, alternatively you are welcome to provide your Credit Card details. Confirmation of your reservation will be sent to you once your payment has reflected in our bank. © 2013 - 2017 Karoo View Cottages in Prince Albert, Great Karoo. Website designed and hosted by Personalised Promotions.